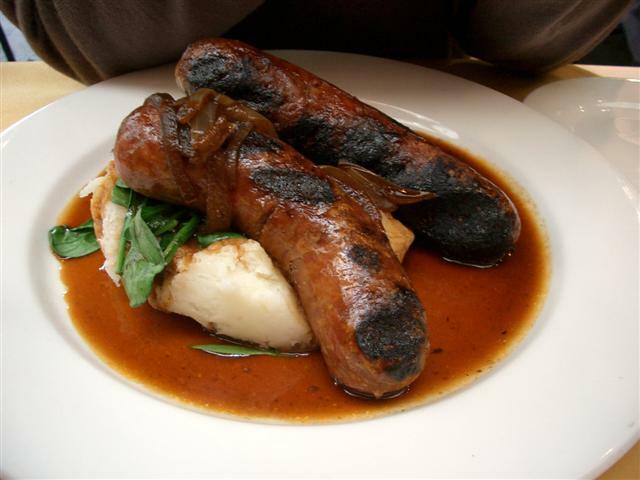 English sausages, colloquially known as "bangers", are distinctive in that they are usually made from fresh meats and rarely smoked, dried, or strongly flavoured. Following the post World War II period, sausages tended to contain low-quality meat, fat, and rusk. Left: Sausages and mashed potato with gravy. Reputedly the term "banger" derived from the excessive water added to the mix turning to steam while cooking and bursting the casing with a bang. However, there has been a backlash in recent years, with most butchers and supermarkets now selling premium varieties. Pork and beef are by far the most common bases, although gourmet varieties may contain venison, wild boar, etc. There are particularly famous regional varieties, such as the herbal Lincolnshire, and the long, curled Cumberland with many butchers offering their own individual recipes and variations often handed down through generations, but are generally not made from cured meats such as Italian selections or available in such a variety as found in Germany. Most larger supermarkets in England will stock at least a dozen types of English sausage: not only Cumberland and Lincolnshire but often varieties such as Pork and Apple; Pork and Herb; Beef and Stilton; Pork and Mozzarella; and others. There are estimated to be around 400 sausage varieties in the United Kingdom. 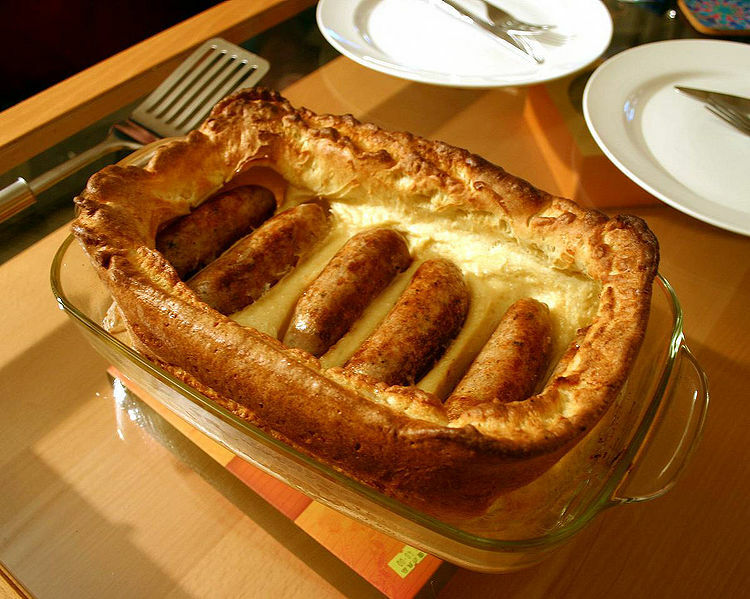 Sausages form the basis of toad in the hole, where they are combined with a batter similar to a Yorkshire pudding and baked in the oven, this can be served with an onion gravy made by frying sliced onions for anywhere over an hour on a low heat then mixed with a stock, wine or ale then reduced to form a sauce or gravy used in bangers and mash. Left: Toad in the hole, ready to be served.